c. Formerly used in the names of many dance tunes (now hist.). Now also arch. in the titles of other musical compositions. 1689 2nd Pt. Musicks Hand-maid sig. G3v, Motleys Maggot. 1695 Dancing-Master (ed. 9) i. 179 Betty's Magot. 1695 Dancing-Master (ed. 9) i. 180 Mr. Beveridge's Magot. 1695 Dancing-Master (ed. 9) i. 191 Huntington's Magot. 1695 Dancing-Master (ed. 9) i. 195 A Song made by Mr. Tho. D'Ursey upon a new country dance at Richmond, called, Mr. Lane's Magot. 1977 P. Maxwell Davies (title of musical composition) Miss Donnithorne's maggot. 1994 J. Buller (title of musical composition) Mr. Purcell's maggot. 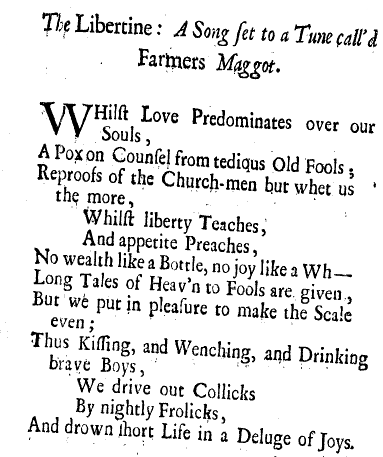 When I used to do a lot of English country dancing, there were several such tunes we used, including "Mr. Beveridge's Maggot" and "Mr. Isaac's Maggot," both from Playford's English Dancing Master (first edition 1651, but the term "magot" appears in titles only from the 1695 edition, and is spelled "maggot" in later editions. 2. Eng. regional (north.). A whim. Paul Muldoon's poem "Maggot", in the recent collection of the same name, plays on both these unusual senses (tune and whim), as well as the usual one (worm or larva). He refers elsewhere to "maggotting" as a kind of obsessive return to something, which is a usage I'm not able to find corroborated. Obligatory reference: John Fowles' A Maggot, which alludes to all the meanings of the word. I presume that the bowdlerized "Wh___" rhymes with "more". The famous rock instrumental, "Maggot Brain", by Funkadelic, is probably not related, but since there are conflicting stories of how that song got its name, I suppose we can't rule anything out. Although it's otherwise an instrumental, there is a brief spoken-word intro to "Maggot Brain" (kicking off with the reasonably well-known line "Mother Earth is pregnant for the third time" etc. ), in which the titular phrase occurs, but I am totally open to an inventive exegesis of what the "earworm" sense might mean in that context. Wikipedia reminds me that the phrase also occurs elsewhere on the album in the lyrics to "Super Stupid." Note the euphemistic typography wh— in a position where it rimes with more. Does anybody here know the meaning of the word in Sylvia Townsend Warner's novel Mr. Fortune's Maggot? I'd imagined "magot" to be a borrowing from French, as many musical and dance terms are: from "magot" meaning hidden treasure. 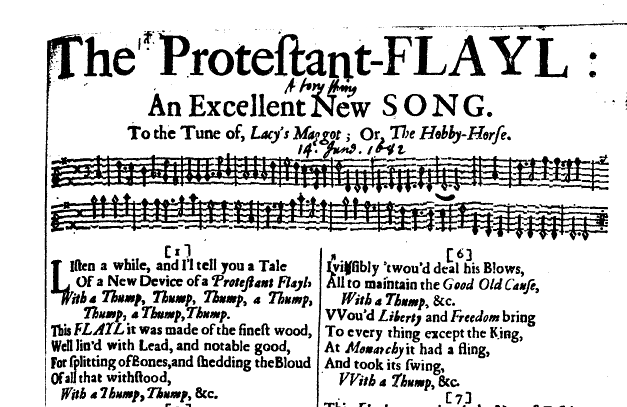 Despite having played a fair amount of seventeenth-century music, I had never come across this meaning before. And now I wonder what relevance it has for Tolkien's character of Farmer Maggot (whose name I have previously taken as solely an allusion to closeness to the soil). Used into the 20th century. A Dorothy Sayers character describes another as "having a maggot for rare books" (meaning, an obsession). The earthworm meaning is no doubt the origin of Tolkien's Farmer Maggot. Perhaps best not to think about the late Iain Banks' Wasp Factory.